LARISSA, THE IDEAL DESTINATION FOR INCENTIVES, CONFERENCES, CONGRESSES, MEETINGS, BUSINESS TRAVEL,INTERNATIONAL CULTURAL AND SPORT EVENTS. Visit the capital city of Larissa to admire the ancient remains and museums, while getting a good picture of the local's everyday life, along with the historic towns of Tyrnavos, Elassona, Agia and Farsala, while numerous traditional settlements offer a trip back in time as they are perfectly preserved. The city of Larissa features a number of luxury hotels to include high end conference facilities, while along the coastline, several resorts can assure a pleasant stay. The highlands of the area offer accommodation in several traditional hotels and villas ideal for nature lovers who appreciate the traditional way of living. 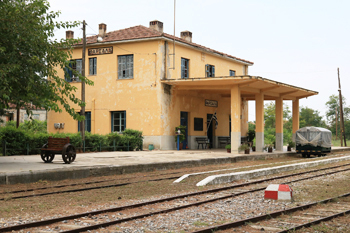 The City of Larissa would probably be the first stopover during the exploration of the prefecture. It is the commercial and political hub of the area, being the capital city, with several modern aspects other than the archaeological sites, to offer all kinds of services and facilities needed. The main large streets include pedestrian areas and squares where locals flock throughout the day. The central and most popular square is Tachidromiou Square where the heart of the city beats day and night. The city also houses the wonderful Alcazar Park with trees, playgrounds, picnic areas, statues, sculptures, fountains, jogging trails and open air theatre. During night the colourful lighting of the fountains create a wonderful atmosphere. Right next to the park is the great Church of Agios Achilios, standing proudly as another landmark of the city. Several towns of the prefecture also well worth a visit, such as Elassona with its defensive walls built by Ioustinianos, Agia with great ecclesiastic interest, the city of Farsala with its long and glorious and mythical history, also connected with Achilles and Tyrnavos with its important biotope and traditional carnival. 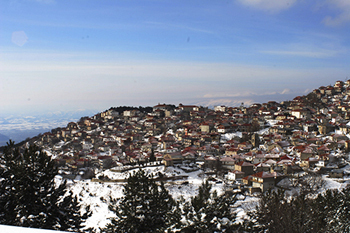 Other than the towns, Larissa region features numerous traditional villages of unique beauty, Ambelakia being among the most popular. This settlement is a preservable area where the first co-operative of the world was founded with main activity the fabrics production and currently features stone paved little roads next to impressive traditional mansions. The traditional villages of Malivia and Rapsani are fine producers of fine quality of wine, widely known across the country. Megalovriso is a traditional hamlet where its architecture has remained untouched for several years where stone and wood dominates its features. Larissa being an area with long history dating back from the Palaeolithic times, has several monuments to depict its eventful past, most of them to be found at the city of Larissa. The Ancient Acropolis of Larissa is situated on Saint Achilles' hill, to feature remains of the Neolithic era. 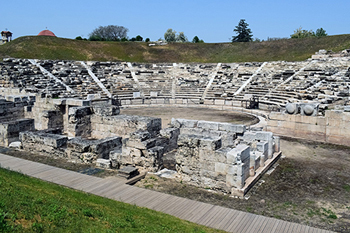 Nearby, the visitors can find the Ancient Theatre of the town with capacity of 10.000 individuals, built by the king of Macedonian Philip, as well as remains of a smaller scale theatre. Right opposite the entrance of Alcazar Park is Hippocrates Monument with its tomb coming to light after an overflow of Penios River in 1826. The region of Larissa features some of the most imposing natural treasures of the country. The two tallest green mountains of the country, Olympus and Kissavos, with the river Penios flowing between them and the fertile plain of Thessaly that dominates the area, along with a long coastline, are the areas main points of attraction. Every excursion related to Mount Olympus, begins at the town of Litochoro, where climbers, hikers, mountain bikers, horse back riders and rock clumbers gather throughout the year to enjoy their favourite sport in one of the most idyllic sceneries. Every year during the winger period, a lot of skiers enjoy the magic of nature and the services provided at its modern ski resort of Vrissopoules. 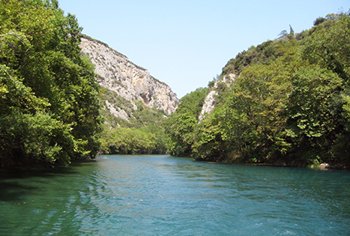 The river of Penios is ideal for rafting and kayaking, offering several rides of various degree of difficulty. 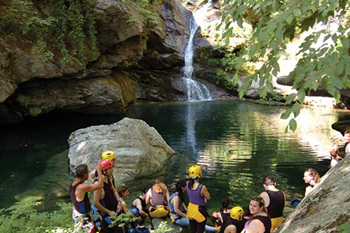 All types of excursions and activities at the region of Larissa offer other than fun, a unique exploration of some of the most amazing natural sites in Greece. One of them is the Tempi Valley, a narrow area between the two major rivers, a natural masterpiece to be further explored when stopping at a rest area where a bridge is swinging above the river. Small boats provide the chance to tourist to take a tour on the river and enjoy the beauty of untouched scenery. After crossing the bridge, the church of Agia Paraskeui and a cave can be found with the cave passage getting smaller and smaller as going deeper to end to a chamber with a natural spring and a pond while locals support that its waters have healing powers. The coastline of the area has several beached for endless times of relaxation with Rakopotamos being the most popular one fully organized to meet its visitor's needs. Other wonderful beaches are Agiokampos, Sotiritsa, Polidendri, Stomio, Karitsa, Kokkino Nero, Koutsoupia, Paliouria, Velika, Rakopotamos and Papakosta. At the coastline of Kastri Loutro is a wonderful beach with a type of sand that is considered to have healing properties of orthopaedic nature. The plain of Thessaly is among the largest in Greece to provide fresh vegetables across the country. The villages Malivia and Rapsani have named the famous wines they produce, while the hilly parts offer for the production of chestnuts. Traditional Greek cooking is thoroughly available to local restaurants and taverns, while the coastal villages offer fresh fish and seafood daily. The area of Farsala is the birthplace of the homonymous sweet halvas, wide known around Greece, while Tyrnavos is an area famous for the production of fine quality of ouzo and tsipouro.